Green = great engagement (right now) - real good, right now. Good engagement and the Tweet density (Tweets/hour containing this hashtag) is in the perfect range. Blue = great for giving your tweet “legs”: our blue grade means that this hashtag is likely to get light engagement now, but get your tweet seen for weeks and perhaps months to come. Red = overused. Twitter or Google+ might tell you it’s trending. There’s a problem with trending, however: this just means that there are many Tweets/updates/posts containing the hashtag while telling you nothing about a history of positive outcomes for those who have included the hashtag in a Tweet. The chance of your tweet with an overused hashtag getting discovered from search or hashtag-clicking (for the stream) are slim-to-none. Grey = unused. Not completely unused, for many, but not used steadily over time. Not a good choice. Right-click on any image in any web page or one that you uploaded to a desktop-to-Instagram solution for Hashtag Suggestions. Click the ones you don't want to remove, then copy all with the button on the right side of the Hashtag Bar. Get the tutorial for any of the many such solutions that RiteTag integrates with here. Highlight a block of text then right-click and select the mouse option, Get Hashtag Suggestions. Type a hashtag and a space to get color-grading of the hashtag as well as Hashtag Suggestions in the Hashtag Bar that opens, and buttons on the right to compare on six data points or copy all. You can also click on any hashtag in the Hashtag Suggestions for remove it before you use the copy all button. Search hashtags for current engagement stats and full 30-day historical engagement analytics. 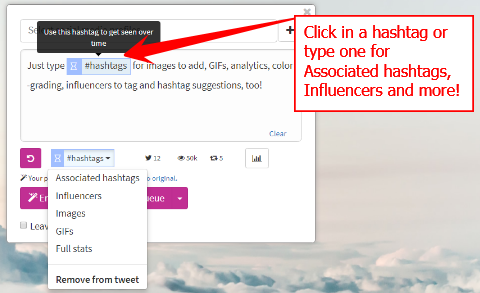 Get Hashtag Suggestions by searching any hashtag. Use the RiteForge extension's browser button to share a web page or highlight text > Share with RiteForge and then click in hashtags or type hashtags to get Hashtag Suggestions and several other options. Click or type a hashtag and then click the hashtag button below for analytics. Pull-down for more options, such as suggested hashtags to add, full analytics page, or get images/GIFs/influencers to add. How to understand and put Hashtag Suggestions (engagement analytics) to work. View unique tweets as your competition, and retweets/hour and impressions/hour as your wins. Change singular/plural, push together or break up words (e.g. test #humanresources #hr, etc. but if #hrtips shows low numbers, try #hr). Try to get 1-2 hashtags with high retweets and/or impressions vs. low relative uniques. Using the RiteTag extension, in any web page click a hashtag to see the Hashtag Suggestions (engagement analytics). View unique tweets as your competition, and retweets/hour and impressions/hour as your wins. Change singular/plural, push together or break up words (e.g. test #humanresources #hr, etc. but if #hrtips shows low numbers, try #hr). Try to get 1-2 hashtags with high retweets and/or impressions vs. low relative uniques.